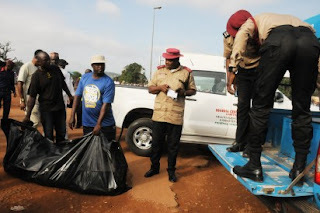 Soldier, mother, child, 2 others killed as tricycle explodes in Biu - BlogIT with OLIVIA!!! The Nigerian Army yesterday said a soldier and four other persons including a mother and child were killed in Biu, Borno State when a tricycle (‘Keke Napep’) accidentally climbed a Improvised Explosive Device, IED, planted along Damboa road, close to a military checkpoint and exploded. Giving details of the unfortunate incident, Army Spokesman, ol Sani Usman said, “At about 8.15am Sunday, a tricycle, known as “Keke NAPEP” unknowingly stepped on an Improvised Explosive Device (IED) planted by the side of Biu -Damboa road close to a military checkpoint at the outskirts of Biu town, Borno State. Unfortunately, the IED exploded instantly killing 4 persons comprising of a woman with her baby and 2 other male adults. “Three other persons were injured including a soldier and they were immediately evacuated to Biu General Hospital. We regret to state that the injured soldier also died at the hospital. While commiserating with the families of the victims of the sad incident, Usman said, “This unfortunate development has brought to the fore, the need for more security consciousness and vigilance among all. “We would like to reiterate that the explosion would not deter us from seeing to the end of Boko Haram terrorists wherever they might be hiding through our ongoing clearance operations. “We want to use this opportunity to solicit for more cooperation from the members of the public to enable us succeed in the fight against the remnants of these criminal elements going by the appellation ‘Boko Haram terrorists’.